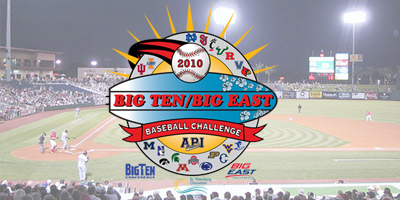 ST. PETERSBURG, FL – The schedule has been finalized and two state-of-the-art major league venues have been added to the 2010 Big Ten/BIG EAST Baseball Challenge, hosted by the St. Petersburg/Clearwater Sports Commission, event manager API Sports announced today. Doubleheaders at Dunedin Stadium and Bright House Field highlight a slate that features 30 games over three days, Feb. 26-28, 2010, at current and former big league facilities in the St. Petersburg and Clearwater, Fla., area. In addition to Clearwater’s Bright House Field, the spring home of the World Champion Philadelphia Phillies, and Dunedin Stadium, the spring home of the Toronto Blue Jays, games will be played in Clearwater at Jack Russell Stadium, longtime spring headquarters for the Phillies, as well as in St. Petersburg at Al Lang Stadium and the Naimoli Complex, both of which hosted spring training for the Tampa Bay Rays until this year. There will be 10 games each day matching up teams from the Big Ten and BIG EAST. Last year’s Challenge, which featured eight programs from the BIG EAST and all 10 Big Ten baseball-playing institutions, was won by the Big Ten, 15-9. Georgetown, which competed in 2009, will not be back in 2010, allowing newcomers Rutgers, Louisville and Villanova to participate. Rounding out the BIG EAST contingent is Cincinnati, Connecticut, Notre Dame, St. John’s, Seton Hall, South Florida (USF) and West Virginia. Big Ten participants include Illinois, Indiana, Iowa, Michigan, Michigan State, Minnesota, Northwestern, Ohio State, Penn State and Purdue. The 2010 Challenge gets under way on Friday, Feb. 26, 2010, with 10 a.m. starts at Naimoli, Jack Russell and Al Lang. Naimoli hosts 10 a.m. and 1 p.m. games on Friday and Saturday, with Jack Russell and Al Lang offering starts at 10 a.m., 1 p.m. and 4:30 p.m. those days. St. John’s takes on Minnesota at 4 p.m. Friday at Dunedin Stadium, followed by a matchup of traditional NCAA Tournament contenders when Michigan faces Louisville at 7:30 p.m. Saturday’s doubleheader at Bright House Field features Notre Dame against Ohio State at 4 p.m., with USF taking on Illinois in the nightcap at 7:30 p.m.
Sunday will be highlighted by the Big Ten/BIG EAST Baseball Festival, a celebration of spring baseball in Florida, at the Naimoli Complex, which will host six games, including Penn State vs. Notre Dame, Indiana vs. Connecticut and Illinois vs. St. John’s at 10 a.m., and Michigan vs. USF, Minnesota vs. Louisville and Ohio State vs. Cincinnati at 1 p.m. Jack Russell will offer Purdue vs. Rutgers that day at 10 a.m. and Iowa vs. Villanova at 1 p.m., while Northwestern will take on Seton Hall and Michigan State will face West Virginia in similar time slots at Al Lang. The St. Petersburg/Clearwater area is home to some of America’s award-winning beaches. Caladesi Island Beach was voted the nation’s top-rated beach for 2008, and Fort De Soto Park received similar recognition in 2005. The area offers 35 miles of white-sand beaches on eight major barrier islands. It’s also within minutes of many popular Florida attractions. Tickets for the Big Ten/BIG EAST Baseball Challenge will go on sale in October. For more information please call 410-472-3500 or go to www.BigTenBIGEASTChallenge.com.